Here is a deeply unsettling article. What bothers me most is not the racist tweets or even that the original tweets were retweeted or favorited. What bothers me most is what caused Kevin Downes to resign. That the school in which he taught and coached and the community in which he lived was silent until, as he says, the tweets made the news. Maybe if what happened in Mahopac was an isolated incident we could say too bad and then move on. But it is not an isolated incident. On the streets where I walk and in the stores where I shop. Disapproving looks are exchanged or eyes are turned away. Questions are asked or concerns are expressed is such a way which only slightly veil the real intent. And, what REALLY makes me swallow hard is the realization that here is just like there. Our unwillingness to face and to talk about or to challenge what is said or done gives tacit permission for it all to continue. Tonight we will sit down together. I don’t know how many of us it will be. Ten or so around a table? Twenty or so around a couple tables? 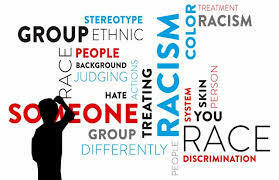 Tonight we will sit down and begin a conversation about racism and prejudice as it is experienced in our communities and a part of our cultural fabric. In the deepest and most honest part of me I know it is a conversation we need to have. A conversation I need to have. As I have thought about our conversation this evening, I have to say I hope it makes me squirm in my seat. I hope it makes me stand face to face with a part of myself and a part of my community that, too often, gets politely gets swept under the rug. I hope I walk away…I hope all of us walk away…a bit unsettled and uneasy. We are long past the point of polite conversations about racism and prejudice. We don’t need to shout at each other or point fingers at each other or blame each other, but we do need to be honest with each other. And for those of us who are white, we need to step back from and acknowledge our position of privilege and to do our best to catch a glimpse of what the world looks like and feels like from the perspective of those who are not as privileged as we are. Tonight we begin the conversation. Like so many others I have done my best to listen to and to read the commentary following the acquittal of George Zimmerman in the shooting death of Trayvon Martin. And, I happened to have the TV on this afternoon when President Obama addressed the topic from his unique perspective of an African-American man and President of the United States. While some of the commentary has bordered on craziness, much of what I have heard and read has been thoughtful as they have begun to name the important issues which need to be talked about honestly and openly. And, I would add, about which we need to listen to each other with the same intensity with which we speak. There are countless venues and ways to begin those conversations. But, this week, as I have listened and read and pondered and prayed what I have come to realize is that I need to start with me. I need to first be able to say that I am a part of the problem. Not because I am overtly racist, but just because of who I am and how and where I grew up. All of that has shaped my understanding of and presumption of what normal is and, without thinking about it, I project that notion of normalcy onto the lives and families and understanding of community of others whose background is very different than mine. Maybe, if I can begin to say that and claim that for myself I will begin to find space I need to have these important conversations with another. One of the new things that I have been trying lately is Pub Theology. Once a month any who are interested gather at a local bar, have a beer together and talk about an issue and concern that faces our communities. We have talked about guns and gun violence, the war on Christmas, and last night about racism and the changing demographics in the communities in which we live. I think there is some truth in that observation that was made. I see it and experience that sense of entitlement as I walk down the streets of the Village where I live. I hear about it when I speak with teachers and administrators in our local school district. I see it acted out as I watch children interact with each other and with other adults in our community. And, it is reinforced each time we hear a commercial tell us, “You deserve it.” And, it doesn’t matter, does it, whether we think commercials make or reflect societal trends, that sense of entitlement is still very much in play. I am not quite sure what to do with the observation made last night other than to do my best to continue the conversation and to see where that might lead. And, in some communities (maybe including ours) there is not much of a distinction between class and race. What I know for sure is this. Whether the cause is class or race or a sense of entitlement, the divide exists and is growing larger, and that is not good for our children, our families or our communities. Besides the results of the Republican primary in New Hampshire and the hype leading up to the South Carolina Republican primary next week, the other headline to splash across the news today is the release of Jodi Kantor’s book The Obamas. What is creating a stir is the supposed clashes between Michelle Obama and White House aides. Of course, she denies that those clashes happened and denies trying to directly influence public policy or political decisions. Of course she has to deny it. Like any First Lady, she has to walk that fine line between being approachable and yet aloof from the swirl of politics; of being poised and polite even when she is not feeling well or having a bad day. If she were to let her guard down for even a moment we all know what would happen. Which one of us doesn’t ever get angry? I get angry over any number of things some important and some trivial. I get angry when I hear a comment about my wife or my children or a friend that I think is unfair or hurtful. Don’t you? I understand that when one enters the political arena comments are going to be made and things are going to be said that are mean-spirited or hurtful or just not true. And, if you are going to be in politics you have to learn to let those type of remarks flow past you. At least as much as you can. And angry at the subtle, and sometimes not so subtle racism, behind the comments that are made. And, sometimes anger is the appropriate response. In fact, I am glad to know that the First Lady is passionate about what is happening in our country and cares enough about her husband to want to offer what “protection” she can. I am glad to know that the First Lady may get angry. There are, after all, things worth being angry about. Isn’t that, in and of itself, demeaning? And, worth getting angry about?